Today my husband and I decided to head for Lancaster County for a weekend visit to a bed and breakfast located in Paradise, Pennsylvania. Although we were concerned about Hurricane Joaquin, we decided to stay the course, rather than cancel and it turns out we were spared a rainy trip. Before reaching our destination, we decided to make a pit stop in Lancaster to explore the city and the Central Market. After we parked the car and stepped out onto the street my nose detected a familiar smell. “Do you think they have Ramen here?” I asked my husband as we walked out of the parking lot onto the street. I soon had my answer. 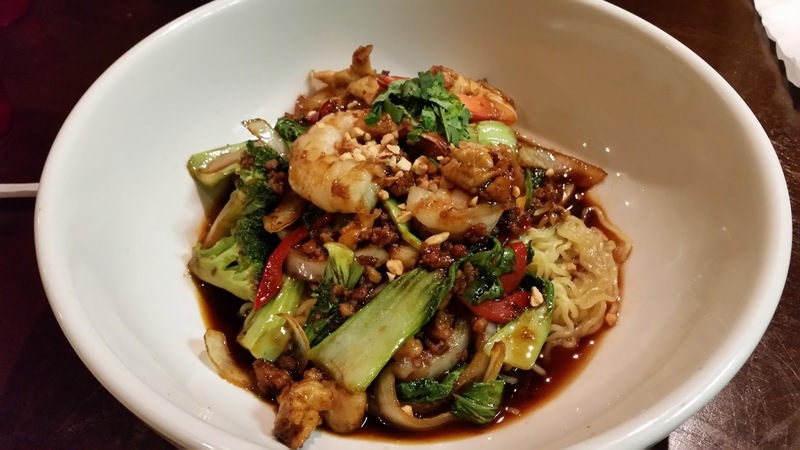 Issei Noodle was located nearby in the Central Market Mall. And to think I thought they only operated in Carlisle. Of course, we HAD to stop in and indulge. 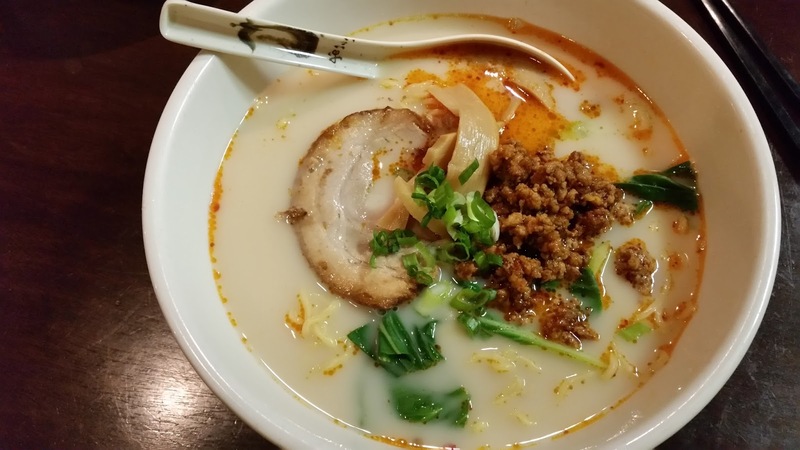 I ordered my favorite spicy tan tan ramen. Ground pork, Bok choy, and ramen swimming in a hearty pork broth, jazzed up with chili oil available at each table, was the perfect, steamy dish for a brisk, autumn day. My husband opted for the Haru warm ramen with the pan-fried noodles, shrimp, chicken, ground pork and fresh vegetables, which I must say was outstanding, but he rebuffed my advances, on his dish that is, so that’s something I’ll have enjoy at a later date. 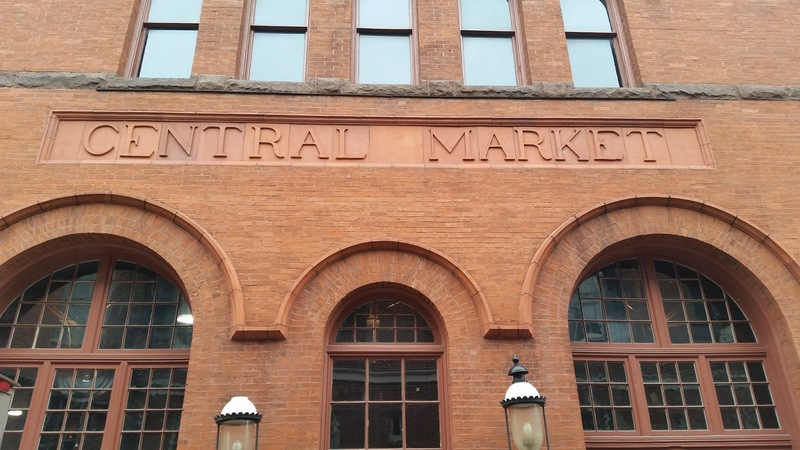 Lancaster Central Market is known as the oldest, publicly owned, continuously operating market in the United States. Today, people from milesaround flock to the market which features about 70 vendors selling everything from meat, to produce, to breads, flowers, herbs and ready-made specialties. 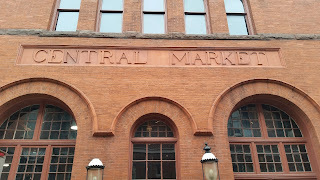 Central Market known as the oldest, publicly owned, continuously operated market in the United States. If we weren’t full from lunch, we could have been tempted by sweets like spicy peanut brittle, pumpkin fudge or sticky buns, or any of the many Pennsylvania Dutch specialties available. Mike had his eyes on Greek dishes like pastitsio, moussaka and keftedes, but we knew that dinner was just a few hours away, so we were content to file the information away for another day. We strolled along West King Street, stopping in a few shops where they offered a variety of items like women’s apparel, accessories, perfume, soaps and cute cards for various occasions. Of course Mike quickly tired of that and I lost him for a bit—which is nothing new. I found him down the street snapping pictures of a Masonic Lodge. Reunited, we passed a building with an interesting sign out front depicting a “Rabbit & Dragonfly.” We stepped inside a foyer and found the set up a bit confusing and wondered where to go next. After standing in a vestibule, we peered into another standing area and two doors later, we found ourselves in a very large coffee shop staring at a man playing chess. Soon we spotted four others at a table in the rear of the room chatting amongst themselves amidst bookshelves. We discovered that we had stumbled upon a coffee shop/performance area and to a very limited extent, a bookstore. 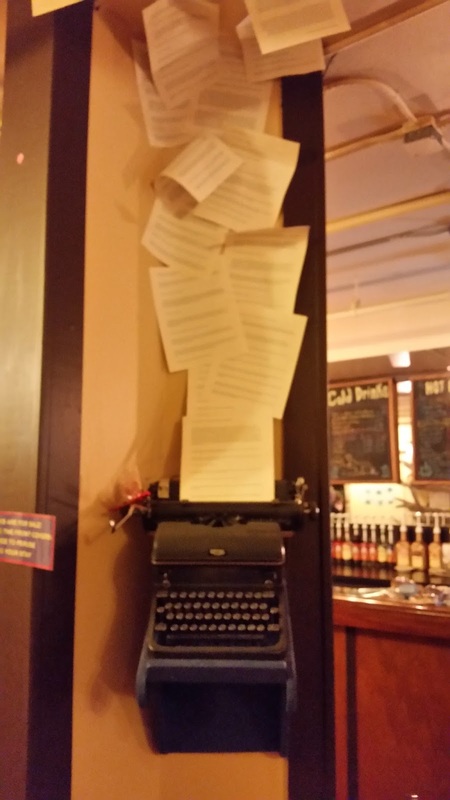 One thing that caught my eye was an old typewriter, which I captured in a picture. 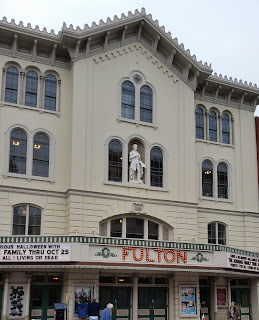 On our way back to the car, we passed the Fulton Opera House dating back to 1852 and touted as the nation’s oldest continuously operating theatre. 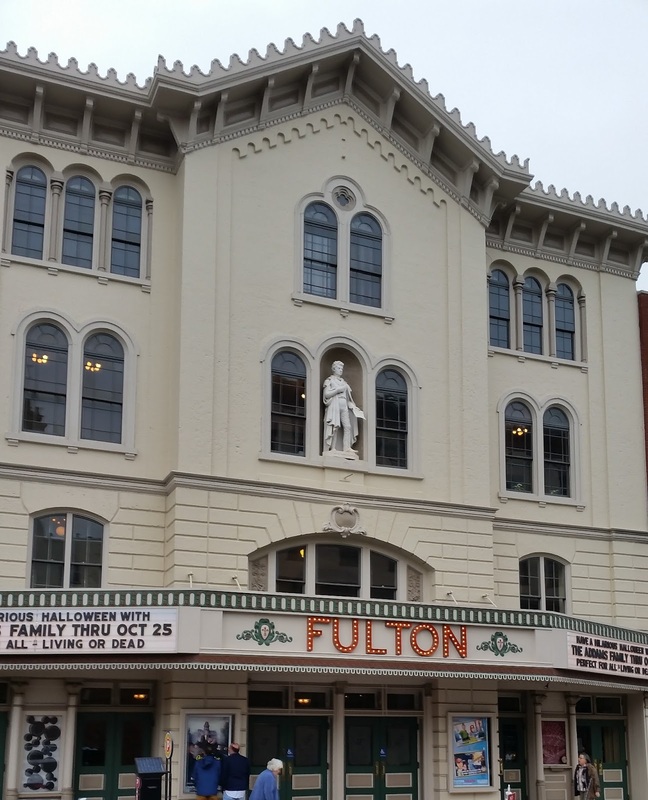 It has the distinction of being one of only eight theatres to be named a National Historic Landmark. Soon we were on our way to our next destination, a B&B, dating back to 1781. Tomorrow, I'll post more about the historic structure located in the little village of Paradise, Pennsylvania.